Lecture performance by Berlin-based collective Slavs and Tatars. 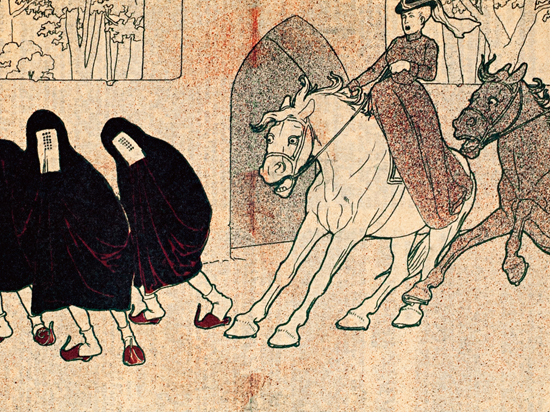 A lecture performance derived from Molla Nasreddin, the Azerbaijani satirical weekly ‘that would’ve, could’ve, should’ve’—a significant 20th century Muslim periodical. Slavs and Tatars address the idea of the anti-modern, self-censorship, and modernity in the Caucasus. Molla Nasreddin: Embrace Your Antithesis has been presented at the Serpentine Gallery, London; Kunstverein Münich; Swiss Institute, New York; UCLA, and New York University, Abu Dhabi’s The Institute, among others. Note: Due to heavy traffic in the Aberdeen Tunnel, please leave extra time to come to Spring Workshop via Kennedy Town/Pok Fu Lam. Presented by Asia Art Archive and hosted by Spring Workshop.